Take papercraft to a new creative level and turn your home into a designer haven with this mindful DIY interiors book by Dutch design duo Studio Snowpuppe. Learn how to create 20 items of functional home decor using simple, origami inspired paper folding and manipulation techniques, and then show off your DIY creations at the heart of your home. Step-by-step illustrations will guide you through the projects, which include beautiful lampshades, creative wall art ideas, an ingenious clock, pretty garlands and decorations, unique vases, candle holders, plant holders, decorative bowls and more--all with a stylish modern aesthetic. Using readily available paper and card stock, you can create some stunning designer accents for your home for a fraction of the cost of store-bought versions. Studio Snowpuppe is a happy, colourful and independent studio in The Hague, founded by architect Nellianna van den Baard and industrial designer Kenneth Veenenbos. Together, they design, make and distribute inspirational origami lamps. They exhibit at design fairs across Europe and their work can be seen in the restaurant at Schiphol airport, the Good Hotel Amsterdam, the Band & Olufsen showroom in Copenhagen and Nudge restaurant in Helsinki, among many other places. They are featured Etsy sellers and have over 15,000 Instagram followers. Thanks to F + W Media and NetGalley for the review copy. Opinions fully are mine. I am one of those kind of people who dabbles in a lot of different crafty pastimes, and was excited to have the chance to read this book. Unfortunately, it was not particularly usable for me. Although I liked many of the projects, they all start with odd shapes on oversized pieces of paper. I wanted to test out one or two of the concepts and determine if I enjoyed making them before committing to creating items that I might actually use as furnishings and decorations in my home. But there was no warm-up projects in this book--nothing that might allow an interested beginner to try some of these folds out using simple supplies that are readily available. If I was already head over heels in love with any of these designs, I would be willing to make the commitment to the projects and find the needed supplies to create a test/sample project and then a final masterpiece. But, since I wasn't already enamored of any of these particular designs, I would rather follow the instructions to fold other decorative items that use more readily available supplies. I received an advanced reading copy from the publisher via NetGalley. Thanks! 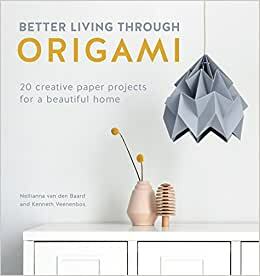 This is a little different to most origami books I have read as it actually creates items that are both useful and "on trend" for the home. I really loved the lampshades, although I did worry about the flammability of them. I need not have worried as it is all explained further into the book. I love the fact that one can make these wonderful articles for the home, put ones own stamp on them and enhance the look of the home simply and easily. The directions are easy to follow with lots of information about materials etc.